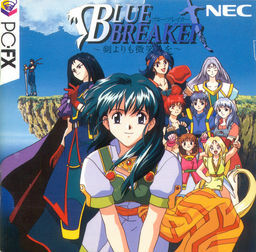 The world of Blue Breaker is called "the path in the middle of empty sky": floating islands connected with each other by bridges. It is the tradition of the people in this world that a fighter's full initiation can be completed only when he finds his true love and marries her. Such day has come now in the life a young warrior named Kain, the hero of the game. His father explains to him that besides the usual warrior's goal of defeating the evil Dark Lord, Kain also has to find the girl of his dreams. He introduces to him a young sorceress named Asha, who becomes his first companion. But on his journey Kain meets many other young women, and it won't be so easy to choose one to whom he can give his heart! "I demand you to do the Moe-Moe Kyun for me!!"